Ice House is the band for you! Ice House is an exciting band with strong female and male vocalists. They have grown in popularity every year and are one of the most sought-after bands in the Dallas/Fort Worth Metroplex. 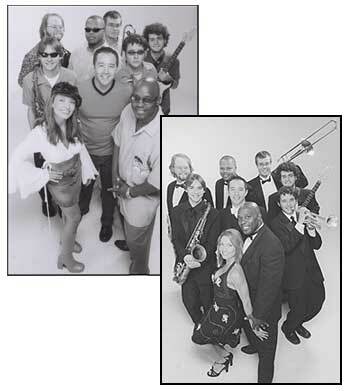 Their vast repertoire contains all styles for a private or corporate party. This Dallas band play the popular music you are looking for whether it be jazz standards, R&B, disco, rock, or soul. They definitely cover all styles of music. In addition to being well seasoned musicians, Ice House also puts on a sensational live show with their great stage presence and high energy combinaiton of party and dance music. If you're looking for a band to make your wedding reception, private party or corporate event a hugh success, here they are. "Dear Carol, I want to thank you for referring the band "Ice House" to us for our wedding at the Hotel Adolphus. Your services made picking a band the easiest thing I had to do in planning my wedding. "Ice House" was fabulous! We were pleasantly surprised to find out that they could learn any requests that we had in advance. I believe that music can make or break a party and "Ice House" truly made the party!" "Ice House was great. In addition to their wonderful music, Yutaka stayed on top of things and helped orchestrate when we cut the cake, threw the bouquet, etc. We got many compliments!" " They were great - Everyone had a wonderful time. Yutaka was very professional and made several calls to make sure everything was like we wanted it." "Yutaka and the entire band were great! We want to extend many compliments we received on to you and the band (including Jerry and Gene Jones)! We had so much fun with the music they played and they sang our 'special song' beautifully. We had so much going on and they handled everything with a very pleasant manner! Thanks for it all!" Mo' Money - Notorious B.I.G. Funky Town - Lipps, Inc. Copyright � 2005 Carol Marks Music, Inc.